1. Enjoy beautiful natural scenery in Korea! This option is 2-Seater Railbike for 1 ~ 2 people. This option is 4-Seater Railbike for 3 ~ 4 people. 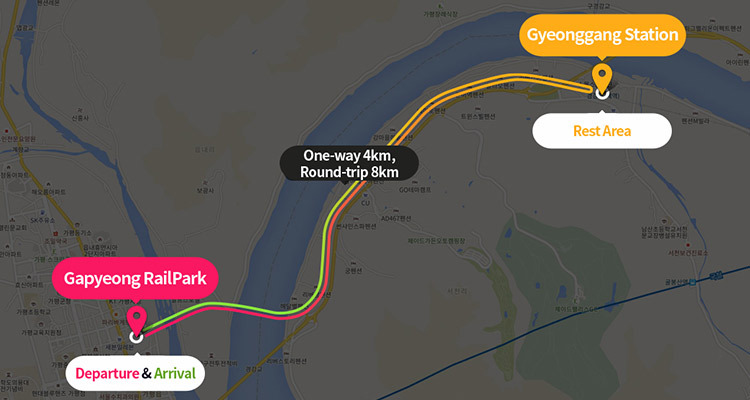 Gapyeong Railbike course is a total of 8km round trip from Gapyeong Railbike to Gyeonggang Station (one way, 4 km). 1. Choose the option and reserve the product on the desired date. 4. Please arrive 20 minutes before the reservation time on the day of the reservation. 1. Gangchon Railbike is a very popular product that your reservation cannot be made at a desired date and time. In this case, our CS Team will contact you via email. Please check your email! 2. Children and elderly passengers must be accompanied by a guardian. 3. Infants under 36 months old are not allowed to ride the railbike for safety reasons. 4. Please do not take unnecessary actions, such as sudden stoppage, unauthorized departure, and playing with other people while riding railbikes. 5. Be careful of your hands or feet not to get caught in rotating chains or wheels. 6. Please keep the safety distance at least 20m to prevent collision with other railbikes. 7. Drinking or smoking is prohibited while riding railbikes. 8. Please get off from the railbike after the railbike has stopped completely. 9. If you lose your ticket, you cannot board nor get a refund. 10. Pets are prohibited on the bike. 11. You must arrive at the station 20 minutes before departure. 12. For your own safety, operation hours may be rescheduled. Q. After making a reservation, can I assume that I can definitely experience railbiking? A. No! Since the railbike is a super popular product, your reservation cannot be made at a desired date and time. In this case, our CS Team will contact you via email. Please check your email until you receive the voucher.